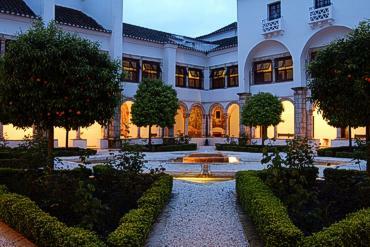 The Pousada de D. João IV is set in the former Convent of Chagas de Cristo in the historical village of Vila Viçosa. 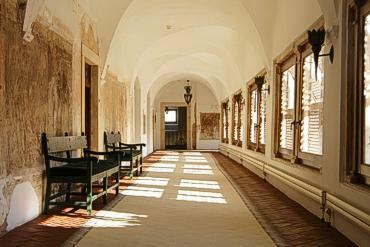 Very characteristic with its intricate theme rooms, full of legends and tales, the Pousada has kept intact the convent cells, the retreats and the oratories built by the nuns. You can also appreciate the exquisite conventional recipes. Around 1514, the Fourth Duke of Bragança, Dom Jaime, decided to found a religious house close to his palace in Vila Viçosa. It would serve dual purpose of Pantheon for the ladies of his House, and would take in the daughters from his second marriage, who could not find noble husbands. Nobody knows the exact date of the foundations, although documentary evidence suggests that they date back to 1514. At that time, the Duke of Bragança was undertaking a great number of works in the town, especially the new castle and the city walls. Despite its local character, this convent, designed in the early fifteen hundreds, revealed the new aesthetic tastes of the Renaissance - the cultural movement which began in Italy in the late fourteenth century - brought to Portugal by João de Ruão and Nicolau Chanterenne. This influence can be seen not only in certain architectural features, in the design of the church doorway, but also in the layout as a whole, in the way the building surrounds the large square, Terreiro do Paço. One of the most interesting features of the buildings is the marble doorway. Italian influences combined with the tradition and tastes of local architects. 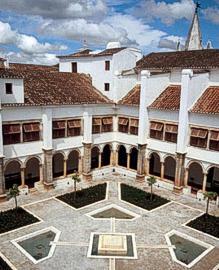 This was the last convent in Vila Viçosa to close. 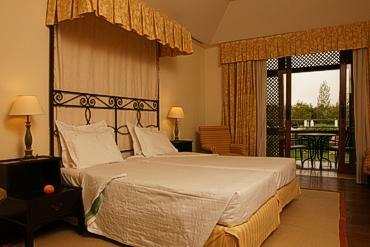 There are 29 Standard Rooms, 2 Double Suites, the Pousada also has 3 Twin Suites and 2 Superior Twins. 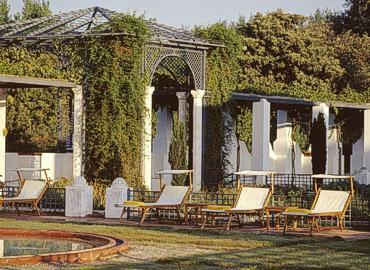 The Pousada also has the following theme rooms: Hunter Room, Botanical Room, Colonel Room, Poet Superior Twin, Musician Suite, Professor Superior Twin, Traveling Painter Suite, Astronomer Suite, Infanta Suite and Duchess Suite. 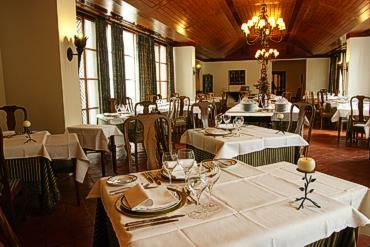 The Restaurant D. Carlos recommends the "Regional Gastronomy Experiment", always combined with the excellent regional wines (Borba, Estremoz, Redondo, Reguengos and Évora). At Saturday dinners you may enjoy the great "Buffet". During summer, the Friday nights are wonderful in the restaurant's esplanade, where you can have the Traditional Barbecue. 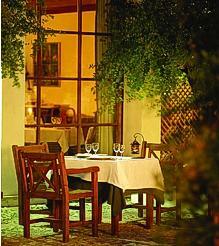 The Restaurant D. Carlos has a refined decoration and offers a voyage through the regional flavours. It has capacity for 100 people. 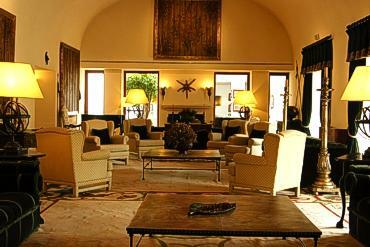 The Bar D. Jaime is decorated with equestrian paintings, that mention the Alta Escola Portuguesa. It is very calm and cosy and is the perfect place for a drink Beside it is the Salão dos Duques, where there are the illustrations of the Dukes of Bragança, as well as the original paintings of D. Amélia Queen. In winter, the fireplace is pleasing and at Saturdays there is piano music to relax and voyage through Portugal's History. The former kitchen of the Convent and its regional oven is now a typical "tasca" of Alentejo named Bar Sabores da Terra (regional flavours), where it is possible to taste the marvelous "Petiscos", the great wine and have intimate conversations. 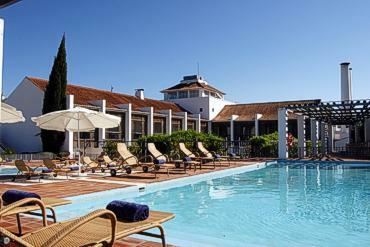 Vila Viçosa, 28 km to the south of Estremoz, is 210 km southeast of Lisbon.